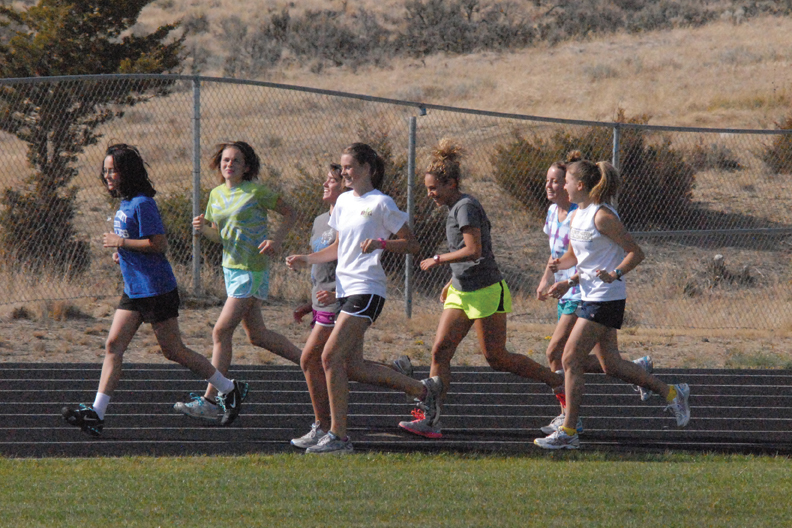 Members of the girls cross country team warm up on the track Monday afternoon at Moffat County High School. The team took sixth place at the Liberty Bell Cross Country Invitational Friday, racing against all Class-4A schools. Runners typically get faster in steady increments as they get into better shape and are able to run against steeper competition. So when the Moffat County cross-country runners dropped significant time between the first and second races of the season, it was expected. The Bulldogs were running on a faster course, and had the first race of the season under their belts, giving them more comfort with the five-kilometer length. The stark improvement Moffat County runners have shown over the season’s first three weeks, though, is off the charts. On Friday the Bulldogs competed at the Liberty Bell Cross Country Invitational at Heritage High School. One of the premier meets of the early-season, Liberty attracted 90 teams from across Colorado to run in four divisions. Bulldogs runners were up against their toughest competition of the year, running in the Division 3 race, typically reserved for 4A schools. But Moffat County ran up to its competition. The girls varsity team finished sixth overall, led once again by senior Eryn Leonard. Leonard finished sixth overall in a time of 19:17.1, 90 seconds faster than she ran a week earlier. Fellow varsity runners Brenna Ciesco (20th), Ary Shaffer (37th), Aubrey Campbell (39th), Katelyn Peroulis (44th) and Savannah Williams (54th) all also ran their fastest time of the year by over a minute. Ashlee Griffiths rounded out the varsity team, running 23:12.4. Trapp said if the girls team had run against other 3A schools, they would have been in the mix with other teams that will contend at the state meet. The boys team, still devoid of much experience, did not finish well in the team competition of the varsity race, but is getting faster as well. Tyler Gerber, a junior in his first year with the team, finished in 22:14 in the team’s first race of the year in Colorado Springs. In two weeks, Gerber has bettered that time by almost three minutes. He ran a 19:26 at Heritage to pace the Bulldogs. Other boys varsity runners Isaac Chacon, Jacob Archuleta, Andrew Keiss and Steven Walls have also dropped at least three minutes from two weeks ago. Remmy Kohpay has improved by almost six minutes since the first meet. While the boys varsity runners were mostly near the back of the race, that was partially a product of the teams they were running against. In the Division 4 race, the boys average time of 21:14 would have been good enough to place get them 16th place, as opposed to the 23rd they took in Division 3. Junior Tyler Gerber said it has been difficult for many of the boys runners in their first season running, but now they are starting to pick up some tricks of the trade.